Given to God, it was placed in God's hand and dried up. 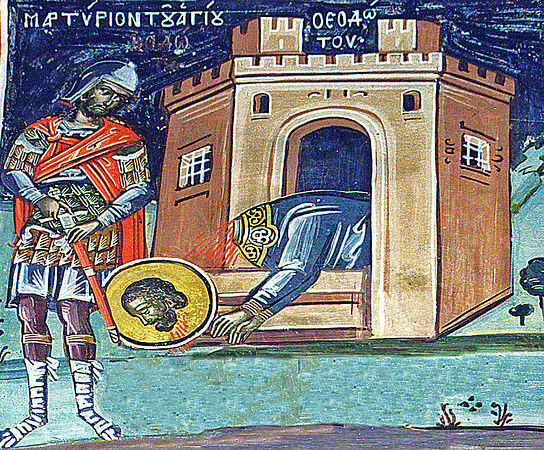 On the seventh Theodotos was beheaded and found to be in heaven. 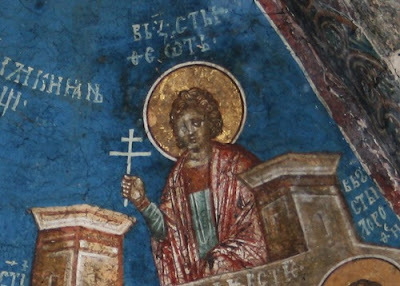 Theodotos was married and an innkeeper in Ancyra during the reign of Diocletian. Although married, he lived according to the word of the apostle: "Let those having wives act as not having them" (1 Cor. 7:29). He maintained the inn in order to unsuspectedly help Christians. His inn was a shelter of the persecuted faithful. Theodotos secretly sent help to those Christians who fled to the mountains and secretly gathered the bodies of those who died and buried them. At that time, seven maidens were brought to trial and tortured for Christ, ridiculed and finally drowned in a lake. One of them, Saint Tekousa appeared in a dream to Theodotos and told to him to remove their bodies from the lake and bury them. In the darkness of night, Theodotos, with a companion, went out to fulfill the wish of the Martyr and, led by an angel of God, succeeded to locate all seven bodies and bury them. But this companion betrayed Theodotos to the judge and the judge subjected him to cruel tortures. 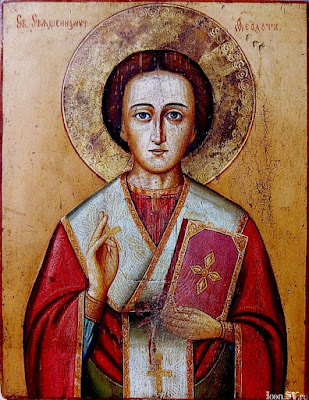 Theodotos endured all sufferings as though he were in someone else's body keeping his whole mind engrossed on the Lord. When the torturer transformed his entire body into wounds and knocked out his teeth with a stone, he ordered him to be beheaded. When he was led to the scaffold, many Christians wept for him and Saint Theodotos said to them: "Brethren, do not weep for me but glorify our Lord Jesus Christ Who helped me to complete this mortification and to overcome my enemy." Having said this, he place his head on the block under the sword and was beheaded in the year 303 A.D. A priest honorably buried this Martyr's body on a hill outside the town. Later on, a church was built on this spot in the name of Saint Theodotos. 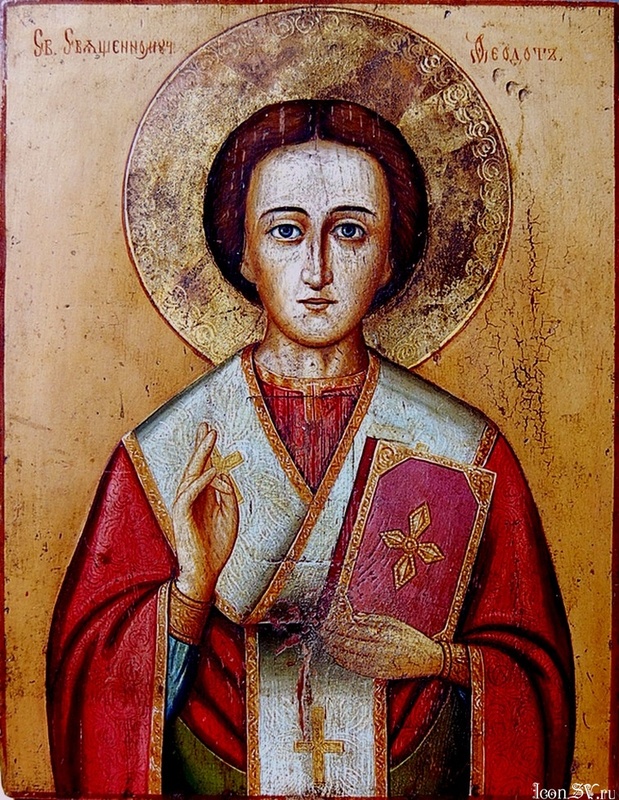 Saint Theodotos is also celebrated on May 18th together with the Seven Holy Virgins. 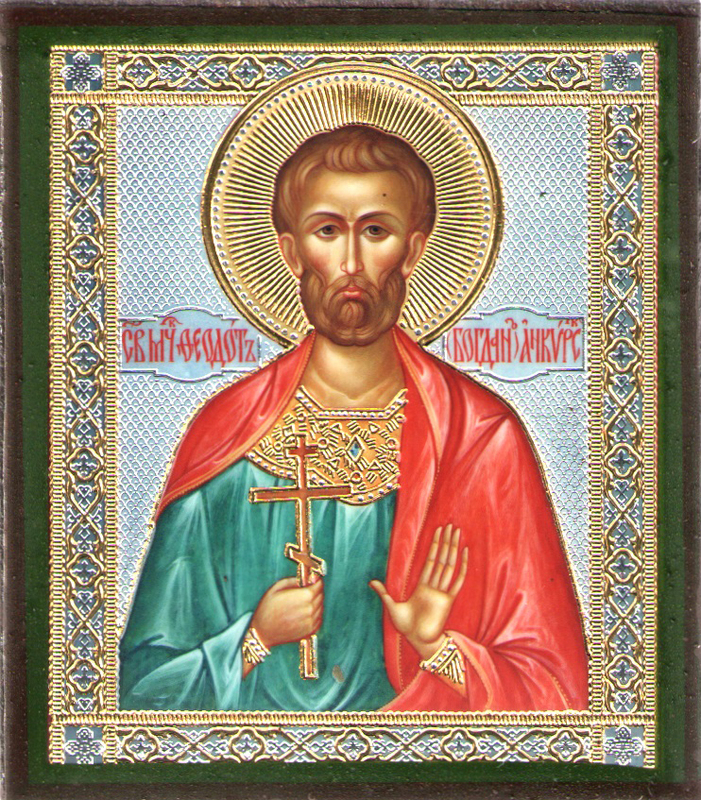 Read also: Holy Martyr Theodotos and the Holy Seven Virgin Martyrs of Ancyra With Him. With a blessing, lunch they ate. And next to him, the presbyter Fronto. Over the relics of martyrs honorable! This place, with a church to adorn. And on this spot to place them! As he said, so it happened. Near Ancyra, on a hill green. God enriched thee with the gift of the sacred ministry, O blessed Hierarch Theodotos. Thou didst offer the excellent deeds of thy contest as gifts to the Lord thy God. 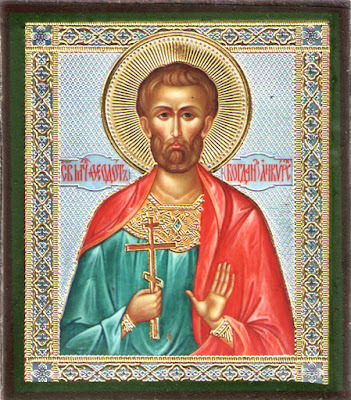 O Venerable Father, entreat Christ our God to grant us His great mercy. O Priest of God Theodotos, thou didst emulate the trophy-bearers. Thou hast received a double crown, and art rejoicing with the Bodiless Ones. And thou art interceding for our souls.